I am pleased to officially announce that my sister Elaine and I are having a photography show and sale for the entire month of August! If you should find yourself driving down the #2 Highway, and are about to pass Holland, MB, take a driving break and pop in to the Tiger Hills Arts Association gallery to see our show. 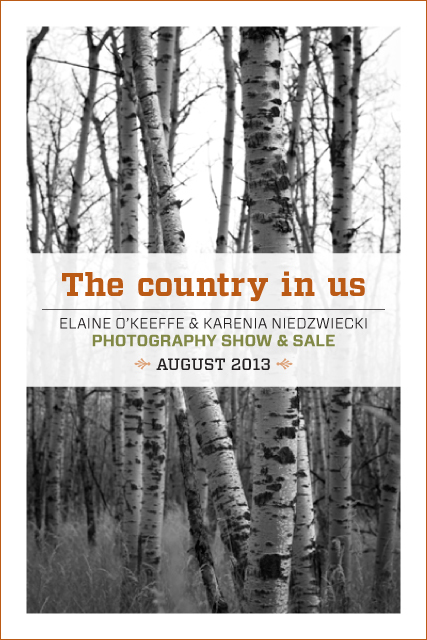 The theme for our gallery show is The Country In Us. Visitors can expect to see a collection of fine art photography, depicting images of home and the bits of country that we’ve discovered in other places. Elaine and I have a strong connection to the Tiger Hills area of Manitoba and find peace, restoration and beauty there. We especially enjoy introducing and sharing the area with friends… so if our gallery show gives you a reason to take a drive out to the country, we’d think that is pretty awesome. For the month of August, the gallery is open Tuesday to Friday from 10 am to 5 pm. Saturday to Monday, by appointment only.